I don’t recall the first time I heard poetry—undoubtedly it was as a toddler, listening to a Mother Goose nursery rhyme. (You, too?) I do remember the first time I was stirred by a work of verse and ever since my appreciation for this ancient, and most universal, form of human expression has been steadfast. During April we have a chance to make poetry a part of our everyday life, as the month is National Poetry Month. Established in 1996 by the Academy of American Poets, this month-long celebration of poets and poetry’s vital place in our culture, is the world’s largest literary celebration. 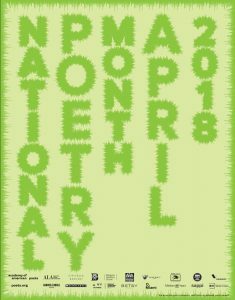 Join us as the Ohio Center for the Book and Cleveland Public Library celebrate National Poetry Month 2018 with poetry readings, poetry craft workshops, and an exercise in community poetry. 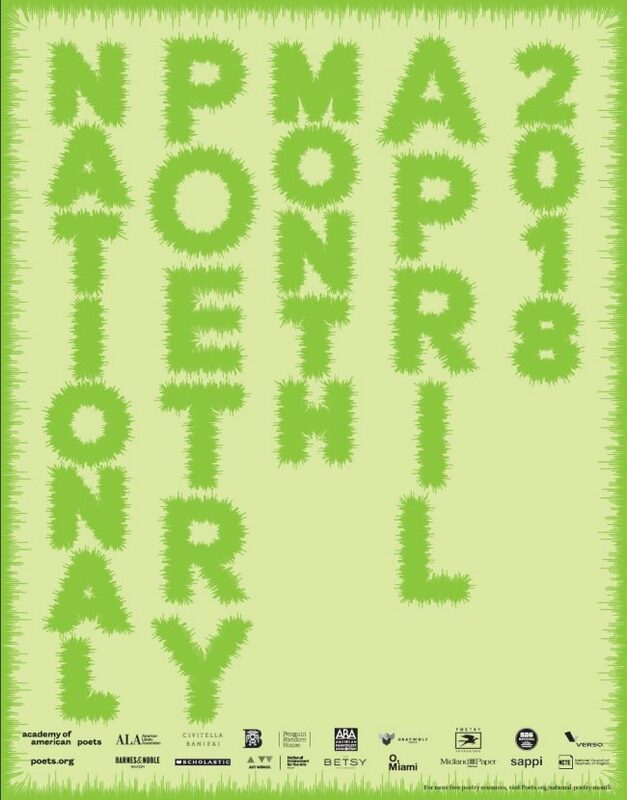 I hope National Poetry Month and the following programs will inspire you to keep celebrating poetry all year long! All events are free and open to the public. POETRY: What’s Your TYPE? | April 2 – 30 | 10:00 a.m. – 6:00 p.m. Visitors are encouraged to take part in an exercise of collaborative verse. Kisha Nicole Foster, Poetry Out Loud Fellow and poet, will compose one line or stanza, and then each participant will contribute another line or stanza, in an attempt to create one collective voice. We’ll provide the vintage Royal typewriter and the paper. All you have to bring is your willingness to be inspired: here’s your chance to sound your “barbaric yawp”! At the end of April the poem will be published on our social media sites. Click here for more information. Open Mic Monday | Monday, April 9 | 12:00 p.m. – 1:00 p.m. Calling all poets and poetry lovers! The mic is yours to share an original or favorite poem, or come and listen. Refreshments and snacks will be served. At the end of the program, there will be giveaways. OPEN MIC POETRY FEATURING CSA STUDENT POETS! | Saturday, April 21 | 1:00 p.m. – 2:30 p.m.
Join us as we celebrate National Poetry Month with six talented young poets from Cleveland School of the Arts. After their performance, we will open the mic. Light refreshments and snacks will be served. Create a Poet-Tree | Monday, April 2 | 4:00 p.m. – 6:00 p.m.
Poets of all ages are welcome to help create the poet-tree. Leaves will be provided for participants to write their own or a prepared poem to hang the poem-leaf on the poet-tree. The poet-tree will remain on display for more poem-leaves to be added throughout April. Create a Haiku Tunnel Book | Monday, April 30 | 4:00 p.m. – 6:00 p.m. In spring, the blooms of the Japanese cherry blossoms have inspired poets for centuries. Haiku call to mind springtime and its fleeting beauty. Create a haiku-theme tunnel book for a lovely memento. All ages are welcome. Click here to view/download the Spring 2018 UpNext, for details of all the programs offered March through May.